Who are the people that have a stake in your issue? Other: Try to include people who have a good understanding of the social problem and thecontext in which the solution is to be created. 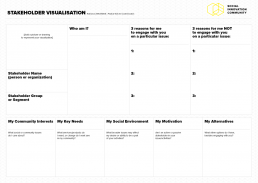 Stakeholder visualization is a tool that will help you gather deeper knowledge of who is your stakeholder, what are his/her needs, motivation and drivers for participating in your innovation. This tool acknowledges differences among preferences, routines and motivation stakeholders can have. Creating a visual summary of stakeholder’s persona will point you to the appropriate ways of customizing your activities, forming an approach to a particular issue and take into account diversity of needs and desires stakeholders may have. This tool can be practiced to get more insights on already identified stakeholders (after Stakeholder Mapping). It can also help you determine what are the characteristics of stakeholders you need to involve and that way help you detect those specific ones (before Stakeholders Mapping). After listing your stakeholders (see People and Connections Map and Stakeholders Maps) use Stakeholder visualization to portrait a typical person that could represent one of the stakeholders. Even though it might not be a real person (could be an organization, network ect. ), try to describe them as a person interpreting their human characteristics. Have each team member visualizing different stakeholder and describing them in the sheet. Compare commonalities and differences between the visualizations and try to discuss the reasons behind the descriptions and add more details.  Keep in mind to visualize the stakeholders persona based upon the common characteristics of the group stakeholder represents.